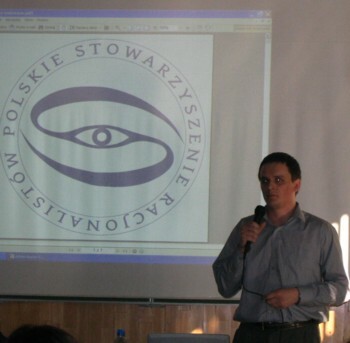 Radzików, a village just west of Warsaw, hosted recently (Oct. 6-8) the First Polish National Conference of Rationalists and Freethinkers organized by the Association of Polish Rationalists (PSR). As Mariusz Agnosiewicz, President of PSR says, it was the first conference of this type in many years, its goal being to integrate Poland's secular movements and to rebuild their organizational structure by attracting unaffiliated freethinkers. „Isolated in a Catholic Country": this is how, in its Oct. 7-8 edition, Trybuna, one of only a few leftist publications in Poland, titled its short article about the Rationalist conference. Over 100 people took part, representing different publications and organizations: The Polish Humanist Association (TH), The Secular Culture Society (TKS), the Polish Association of Freethinkers (PSW), and others. (I represented the Council for Secular Humanism and the American Humanist Association and spoke about the challenge and hazard of teaching secular humanism at an American college.) Also represented were "Fakty i Mity, a leading Polish anti-clerical weekly, Ateista.pl, and others. Among the featured speakers were Andrzej Dominiczak (TH), who highlighted controversies and divisions within the world humanist movement; Jolanta Marcinkowska (TKS), who discussed the problems of secularism in Poland, an overwhelmingly Catholic country; and Mariusz Agnosiewicz (PSR), who outlined the development of PSR. Highly-acclaimed Polish law philosopher and writer Prof. Maria Szyszkowska talked eloquently about the problems and challenges of freedom in a free society. Bogdan Mis, a well-known Polish journalist and editor, discussed different concepts of freedom of the press. Three Polish political parties also sent their representatives. Of those, the speech by the articulate Joanna Senyszyn-of the Alliance of the Democratic Left (SLD) and former senator-attracted the most attention. She addressed the complex and controversial issue of the separation of church and state, an issue that is nowhere near being resolved in Poland because of the privileged position of the Catholic Church. Regrettably, Prof. Barbara Stanosz-co-founder of the most influential Polish Humanist journal, Bez Dogmatu (Without Dogma) and its former editor-and Prof. Jan Wolenski, a prominent Polish philosopher and writer, could not attend due to health reasons. Despite the fact that the conference coincided with a weekend of several political demonstrations in Warsaw, which diverted attention from all other events scheduled at the time, and despite some organizational problems, the unanimous opinion of the participants is that the conference was a success and that the Polish rationalist/humanist/secular movement is now energized enough to grow and to offer national conferences every year.